Solar Industries Tubular Skylights - Skylights Manufacturer & Closet Doors | Solar Industries Inc. The “SKYVIEW® TUBELIGHT” Solar Lighting System is an innovative, but simple, design based on two principles, maximum light collection & simplicity of installation. There are several features that distinguish our tubular skylight from the competition. 1. We use a high quality True cast acrylic double dome design which is drop formed to preserve the UV properties of the acrylic, so our domes will only yellow about 3% after about 20 years, in contrast some of our competitors who use an injection molded plastic dome which can yellow as much as 15% after only 5 years. The top dome collects light, while the inner dome distributes the light evenly down the tube. 2. Our domes come factory sealed to the tube using a leakproof seal method. The outside dome assembly is sealed to the tube section with a high quality silicone sealant. This means there is no sealing of the unit on the jobsite, just a little caulking around the roof jack. 3. Our tubular skylight installs through a paintable galvanized steel roof jack with a storm collar. By using this method, rather than using a plastic or fiberglass flashing, you are allowed much more flexibility. For instance you may trim the flashing to accommodate whatever roof pitch you have. The flashing is multi pitched from a flat roof application to a 6:12 pitch with a 12:12 pitch flashing available. 4. The heart of the design is the pipe itself. We use a finish on our aluminum, versus a film which causes distortion of light. The finish is a Silver etching process which plasma fuses the silvering to the aluminum. This finish can never peel or delaminate, like most films will after time. 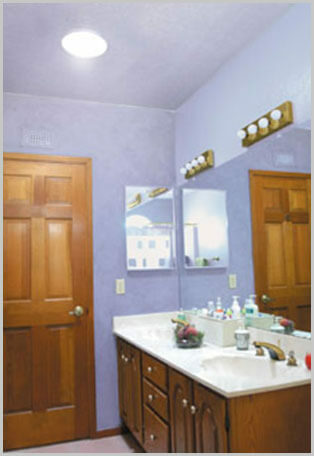 Due to the advanced variable pitched flashing we use, most installations do not require elbows. We recommend that you keep the tube straight for maximized light transmission, but do offer elbows for those really tight installations. 5. When the Skyview® Tubelight is properly installed, it requires no maintenance. That means no dust, cob webs, or bugs in your skylight diminishing the output of light over time. We achieve this by providing high quality seals at all points of entry. 6. The Skyview® Tubelight is available in two sizes, an 8″ diameter that will illuminate up to 150 square feet, and a 12″ diameter designed to light up to 300 square feet. As with all of our skylights the Skyview® Tubelight is covered under a lifetime warranty. In recap, it is the simplicity of our design, which makes it, by far, the easiest product of it’s kind to install. It is also this simplicity that allows our unit to out-perform the competition.